Dentsply© Drufomat Scan Pressure Machine is a top-of-the-line, lab-quality machine used to fabricate custom oral appliances such as athletic mouthguards, nightguards for grinding/clenching, bleaching trays for teeth whitening, orthodontic retainers and other dental appliances. Designs for Vision Inc.© Dental Loupes with eye magnification and LED headlight are worn for all exams and procedures to improve visibility and the quality of dental work. Digital x-rays reduce the amount of radiation needed as compared to film x-rays. The improved diagnostic capability of digital x-rays and the ability to view the x-rays on a computer screen allow the patient to better understand and follow treatment. Digital x-rays by Instrumentarium Orthopantomograph® OP300 are instant, so there is no longer a need to develop the film. Digital x-rays save time and increase patient care. It’s also a very green technology. 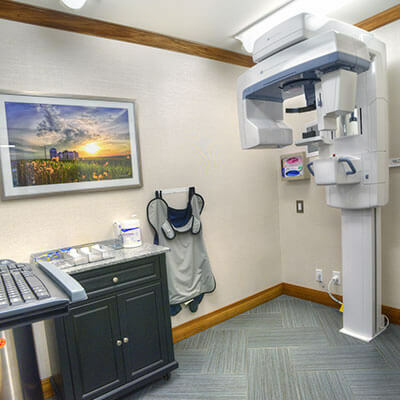 By eliminating film, developer and chemical waste, digital x-rays are better for both the patient and the environment! Using Patterson Eaglesoft Electronic Medical Records, our practice is able to quickly and accurately access patient information in order to provide the utmost in patient care. This helps to ensure patient confidentiality as well as reduce the need for paper. Using a digital format allows for quick access to patient information when needed for insurance records while providing a secure filing system. An intraoral camera combines the latest video technologies with dental care. Both the patient and dentist can see detailed images of the teeth and mouth in real time. With Schick USBCam intraoral cameras, patients are able to better understand what is happening and review the status of their oral health. With this latest technology, an Acteon SoproLIFE intraoral camera detects cavities that are not yet visible to the naked eye. This technology enables dentists to practice minimally invasive dentistry by providing a better possibility of diagnosing this disease at an early stage.